“We only paid off our student debt eight years ago. Think about that—I’m the President of the United States.” With that statement and others President Barack Obama brought laughs, yells, and awed silences to the thousands gathered at the Coors Event Center yesterday. Many in the crowd had been waiting the entire day in order to get a good view of the president. Some classes were cancelled, bus routes were changed, roads were closed, and the Secret Service was positioned all over and even on top of the Coors Event Center. Granted, even with these measures campus security did not seem as tight as on 4/20, which was a few days prior. The atmosphere in the center was excited but also perhaps a little tired; probably due to waiting in the 80 something degree weather for hours. The Coors Event Center was stuffy and even a bit humid. After a brief introduction President Barack Obama took the stage and received a standing ovation. The President said, “You guys are just glad school’s almost out.” Which, of course, led to more cheers. He described his meal he had just eaten at the Sink and his encounter with a young woman, who in her excitement spilled yogurt on Obama and the Secret Service. The main focus of the evening was student loan reform and rising tuition costs. This topic is close to home for many CU students with the upcoming tuition hike. 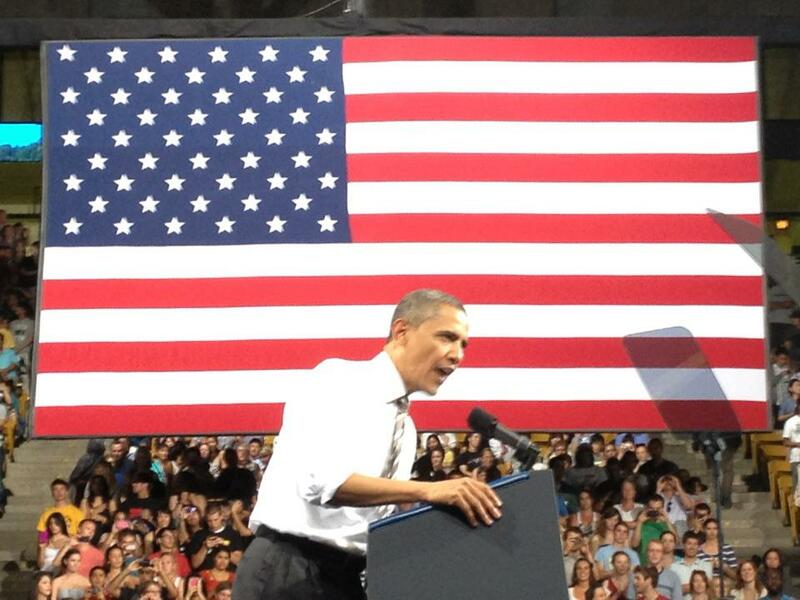 Obama emphasized the importance of young Americans seeking higher education. ‎He said, “College is not only the best investment you can make in your future—it’s the best investment you can make in your country’s future.” Obama went on to empathize with the difficulties students face in paying for this education. He described the early days of his marriage to Michelle, how they had almost no assets and combined their student debt when they got married. He acknowledged that the situation is only getting worse for students these days. Obama encouraged the audience to write their congressmen about interest rates on federal student loans, which if Congress doesn’t act before July 1st, could start doubling. Obama fears this could prevent the middle class from being able to afford and attend college. Demonstrating that he’s hip to social media, Obama suggested that they could also facebook and tweet Congress members as well. Obama’s speech lasted just over half an hour. 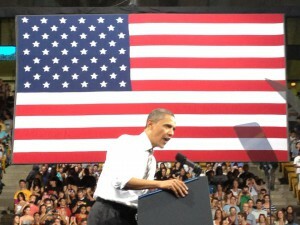 I was there and it was amazing: http://tinyurl.com/ObamaFillsCoorsEventCenter I’ve rarely seen the Event Center filled so full. Note – this photo was taken 45 minutes before the speech began and the arena was even fuller by then. The folks in line (at least near me) were good-natured about the wait and clearly excited to see the President. When Obama responded with “I believe in you” you could feel the crowd’s approval as they roared applause. Every time the crowd cheered, the building literally shook. I was there in 2008 when Michelle Obama spoke: http://tinyurl.com/MichelleObamaFarrandField2008 and it was no less thunderous. You could hear the echoes off the Flatirons behind her. Let Freedom RING! I teared up a bit at the “I believe in you moment.” Very cool opprotunity, glad that the CU and the Boulder community were able to experience that.